Hello and welcome to Cyclingnews' live coverage of stage 11 of the Giro d'Italia from Modena to Asolo. Riders are gathering in Modena - famous of course for its balsamic vinegar - for sign-on. In around 15 minutes they'll be rolling out for the neutral start. We're pretty impressed with today's start location. This might just be the finest of the race. Chapeau, Modena and your Piazza Grande. Bob Jungels is the new leader of the race today, and his bike has been duly fitted out with pink customisations to go with his maglia rosa. And they're off... The riders have made their way through the short neutralised section and racing is underway. Cyclingnews and other media sat down this morning with Mikel Landa, who abandoned the race yesterday and left for the airport ahead of today's stage. You'll be able to read the Spaniard's thoughts shortly. As expected, lots of attacks flying around straight from the flag. Nothing has stuck just yet, however. Nine riders have managed to open up a gap on the bunch. They have a slim advantage but have not been let off the leash just yet. The breakaway hopefuls have opened up an advantage of nearly a minute. They are: Manuel Quinziato (BMC), Moreno Moser (Cannondale), Leigh Howard and Roger Kluge (IAM) Giacomo Berlato (Nippo Vini Fantini), Anton Vorobyev (Katusha), Manuele Boaro (Tinkoff), Pippo Pozzato and Eugert Zhupa (Wilier Triestina-Souheast). These guys can't settle down yet. Lampre and Bardiani are forcing a high pace on the front of the bunch. These nine riders have just under a minute as they pass the 200km-to-go mark. That's right, we've ridden 27km and there's still 200 to go - this is a long one. Lampre-Merida aren't totally happy with this break, it seems. They're still pulling and, with such a long stage, many riders in the bunch won't be too happy they've not been allowed to ease up yet. Here's the interview with Mikel Landa from this morning. The Spaniard talks about his struggles with illness that caused him to abandon the race. Also discussed was the possibility of the Tour de France now being on his radar. Despite its size, the breakaway group has had to admit defeat. They have slowly but surely been reeled back in. Expect more attacks now, before Lampre and co settle on something they're happy to see go up the road. 50 kilometres covered. All together. You can catch up with yesterday's action with our stage 10 report, which includes full results, a photo gallery, and video highlights. The frenetic start to this stage has resulted in a whopping average speed of 51.5km/h for the first hour of racing. Again, on a day well over 200km, that will not be welcomed by all, and may well take its toll later in the race. We're heading further north today, with the finishing town of Asolo situated just below the Dolomites. It has plenty of cycling heritage, too, with the headquarters of Selle Italia and Sidi both based there. After nearly 70km, we still have no breakaway. 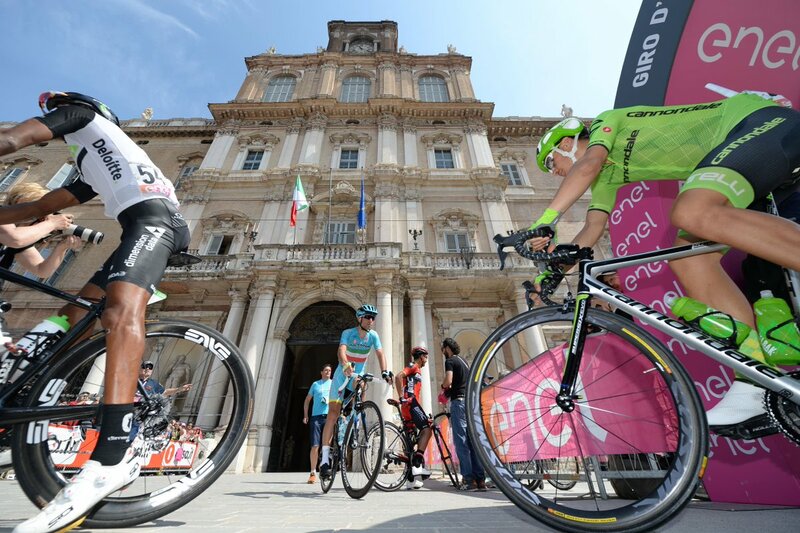 As the Giro roadblock tells us, today's stage takes in no fewer than seven Italian provinces: Modena, Bologna, Ferrara, Rovigo, Padua, Vicenza, and Treviso. Another move off the front now and Vegard Stake Laengen (IAM), Liam Bertazzo (Wilier Triestina-Southeast), and - once again - Anton Vorobyev (Katusha) have opened up a gap. It looks very much like this is our break. The trio have quickly accumulated a lead of 1:30. 8 minutes is the gap now as the break comes though Badia Polesine just shy of the feed zone. "I think it's impossible to be in a better position"
Andrey Amador went on the offensive in search of the maglia rosa yesterday, and though he couldn't get his hands on it, he and teammate Alejandro Valverde are now very nicely positioned indeed - 2nd and 3rd on GC. You can read Amador and Valverde's take on things right here. Average speed in the second hour of racing: 49.7km/h. Under 50km/h but still bloody quick. Expect the third hour average to be a lot more sedate. Over 10 minutes now for the break. 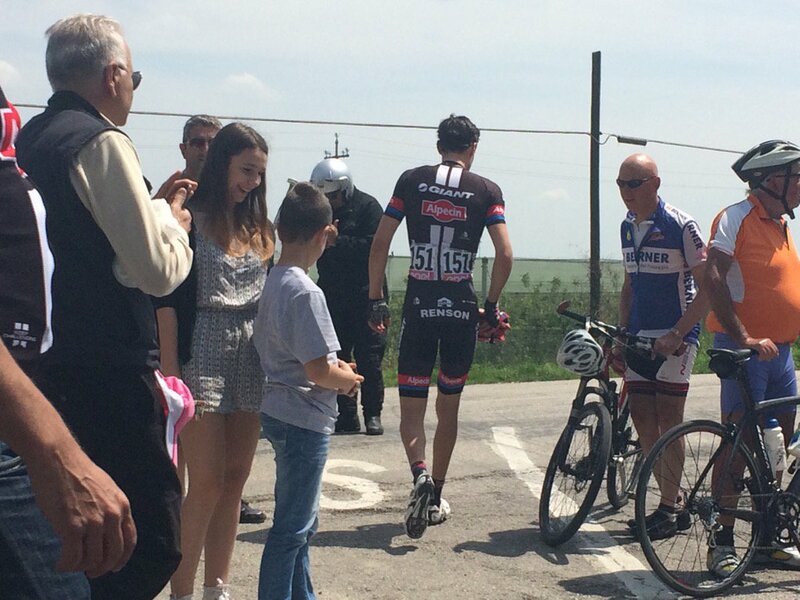 It seems that Tom Dumoulin has abandoned the race at the feed zone. BMC DS Marco Pinotti just posted this photo of the Dutchman on Twitter. Dumoulin, of course, has been struggling with saddle sores in recent days and a withdrawal has been on the cards. 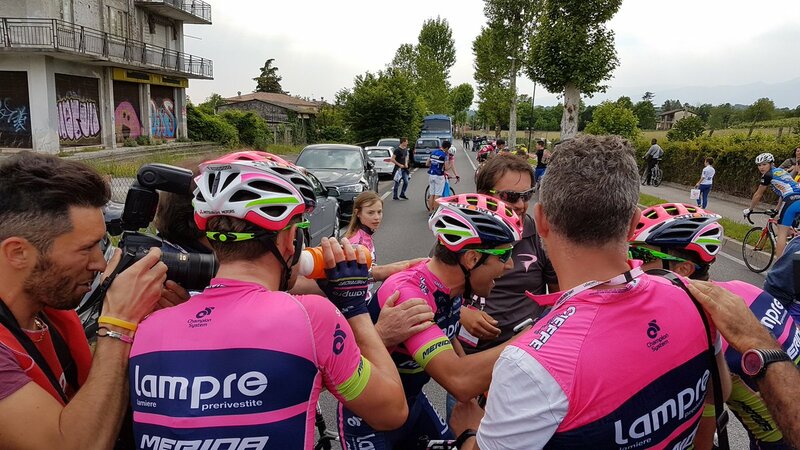 He lost 13 minutes yesterday and and, despite a really strong start and a spell in pink, his Giro has taken a turn for the worse ever since stage 8. Unfortunately @tom_dumoulin has been forced to abandon the @giroditalia due to saddle sores. More details to follow. 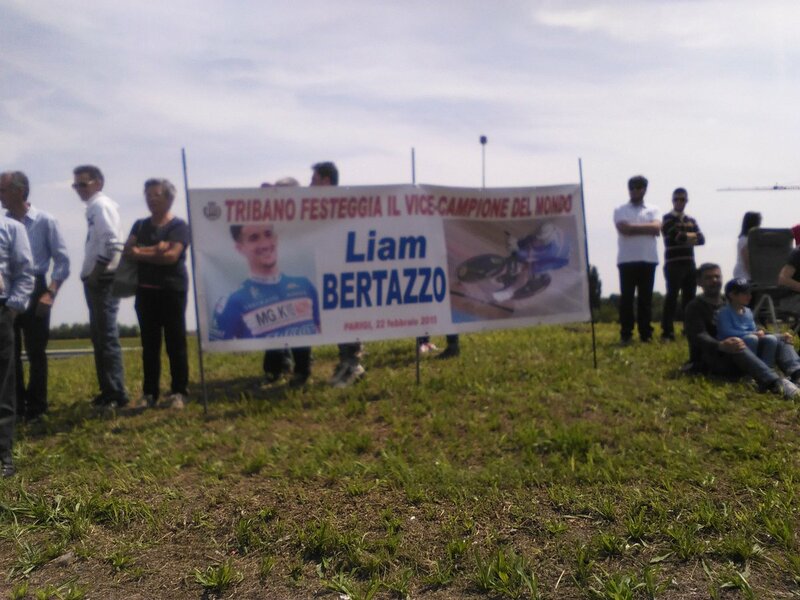 This picture from @SpazioCiclismo shows some of the support out on the roads for local rider and breakaway member Liam Bertazzo. Under 100km to go now and the leading trio still have a healthy lead of 10 minutes. Here's our story on Dumoulin. We're hearing that the wind is quite high out there and the breakaway have seen three minutes shaved off their lead. We're approaching the first intermediate sprint point of the day at Grisignano di Zocco. There are overall bonus seconds but these three breakaway riders will mop them all up. We could see sprinters in the bunch fighting it out over the last of the sprint points for the red jersey standings. Vorobyev crosses the line first to take maximum points at the first intermediate sprint. There's a battle on in the bunch as Arnaud Demare gets a full-on leadout from FDJ. Matteo Trentin (Etixx-QuickStep) shows plenty of interest too and runs the Frenchman close. Just under 75 km to go and the break continue with a lead of 4'23. At the front of the peloton Trek, LottoNL and Etixx share the workload. The work from the peloton is starting to pay off, with the gap dropping to 3'49. An incident at the front of the peloton as a spectator, lets not describe them as a fan, throws liquid at a rider near the front peloton. Not what anyone wants to see. We've taken a look back at Team Sky's run at the Giro d'Italia since 2010. You can read the feature, right here. The break continue to lose time, their advantage down to 3'22 with 59km remaining. Back in the bunch the maglia rosa is being paced back after dropping back to the team car. FDJ are doing an entire lead out for Demare at the intermediate sprint. He has every one of his teammate with him, and there's a brief split. Demare takes it, just, from Trentin. 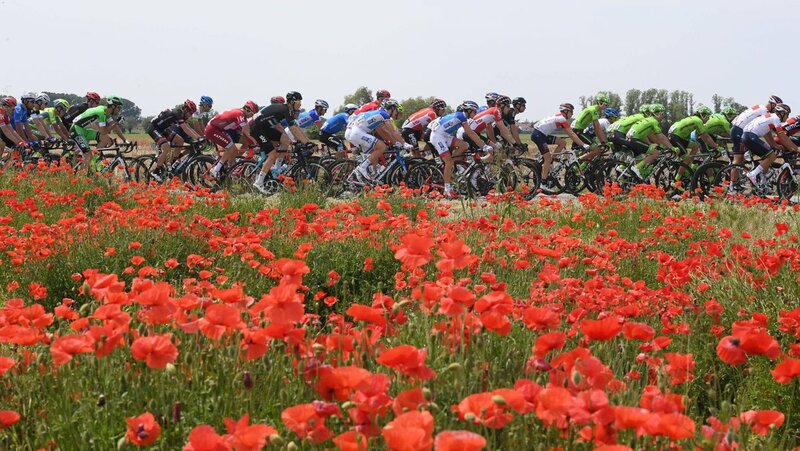 It was a couple of days ago but here's our rest-day podcast from the Giro d'Italia. 50km to go in the stage, the gap down to 3'22 as we see Trek Segafredo position a couple more riders on the front of the peloton. A group of Movistar men gather at the front of the bunch, huddled around Alejandro Valverde. Lampre-Merida take it up now - Diego Ulissi could be a candidate for the stage win here - but the pace isn't too high at the moment. It's time to start thinking about this finale. Here's a reminder of the profile. Just under 190km covered so far. And here's that all-important climb. There are ramps of 16%, which should shake things up considerably. It's a perfect launchpad for a late attack but we could well see attacks among the GC favourites too. After a technical descent, this is the run-in to the line in Asolo. Very tricky indeed, and even a bit of pavé thrown in there. It will be fascinating to see how the different teams play this one, and who will try to control things. Anything could happen - should be an exciting one! How do you see this one playing out? Massive pile-up here with Arnaud Demare going down and several other FDJ riders caught up. Leigh Howard was thrown down the grass banking and into a ditch, where he's lost his glasses. Evgeny Petrov is back on his feet but looks hurt. Meanwhile Michele Scarponi and Pieter Serry, two key domestiques for Astana and Etixx respectively, have been held up and now face a chase back on. Caleb Ewan also caught up in that crash. Lots of small groups frantically trying to catch back up with the peloton. Domenico Pozzovivo is behind, as is Gianluca Brambilla. It seems they're the only GC riders affected. Pozzovivo is being paced back thanks to four Ag2r teammates. Tinkoff and Movistar, both of whom escaped damage in that crash, are keen to push on here. The break is splitting up now and they have just 30 seconds on the bunch. It seems Greipel doesn't fancy his chances today. He put in a huge turn on the run-up to the climb. Maybe Tim Wellens is their card today. We're hearing that Pozzovivo is 1:30 behind. Laengen is our leader at the moment but it won't be long before he's caught, it seems. Less than 15 seconds is his gap. Lampre take the bunch up this climb. No attacks just yet. Nibali on his own after his teammates were taken out in that crash. Betancur makes his way up to Vorobyev, and now Cunego has a go. Those little attacks come to nothing and it's now Steven Kruijswijk who takes it up. Laengen is caught just shy of the summit and now Kruijswijk really goes! The GC favourites are forced into action, with Valverde on the wheel of the Dutchman. Splits behind the main men. Right then, onto this technical descent. We have a group of nine at the head of the race here. Andrey Amador, second on GC, is not in there. We have Kruijskwijk, Valverde, Chaves, Nibali, Jungels, Formolo, Zakarin, Majka, and a couple more. Nibali is tearing through these hairpins and opens up a small gap on the front. This group, which itself is splitting up, has a sizeable gap now at the head of the race. Nibali is going for this as he comes off the final corner and onto the flat. Valverde is a few bike lengths behind and has to really sprint to get back on terms. Nibali has been joined by Valverde and Chaves to form a trio. And they have a decent gap here. This is well and truly on. What a descent by Nibali to force the issue here. #giro is @alejanvalverde going into Pink today ? @BobJungels got his work cut out for him now. Jungels and co make the junction to the leading trio. Amador is back in there and he attacks! Jungels makes the bridge as Kruijswijk attacks from the group of favourites. Some were saying this could be a sprint stage. It's turning out to be a true GC day. Jungels hits the front now. He's really pushing on now, and event gaps Amador slightly. Lots of riders coming back to the chasing group of favourites. Among them Ulissi and Sonny Colbrelli. The road kicks up again and Jungels is still showing no sign of easing up on the front here. Chasing bunch is led by Damian Howson of Orica, and they're about 10 seconds back. Bardiani lead the chase now as more riders regain contact. It's a single file line at the front of that group but Amador and Jungels are keeping them at bay. Two Trek-Segafredo riders are in this group and they are Giacomo Nizzolo and Ryder Hesjedal. Hesjedal still up there or thereabouts on GC, while Nizzolo is probably the fastest finisher in there. It's up and down all the time here. Jungels is looking so strong. Every time Amador peels off, a gap opens up and he has to fight to get back on the wheel. Caleb Ewan is in this chase group, it seems. Another contender for the stage win now. Pozzovivo still chasing hard, but he has no teammates now. He's well behind this chase group, but we don't have a time gap just yet. Jakob Fuglsang also with him. The road kicks up again and it's Jungels doing another turn. In the group behind, Ulissi attacks! Ulissi knows there are faster sprinters in this group and is understandably keen to apply the pressure. He closes in on Jungels and Amador in no time. Onto those cobbles now as Kruijswijk digs once again. Jungels gets another gap as he comes through for a turn. What a show of strength this is. Nibali, Valverde, Majka all safely up there in the chase group. The Pozzovivo group is over a minute back. Under 2km to go now and this leading trio still has 10 seconds over the chase. Ewan dropped from the chase group. Trentin and Battaglin in there, as is Nizzolo. It looks like Jungels has defended his pink jersey, but who's going to take the stage win? Jungels grits his teeth and really grinds that big gear. Amador behind, then Ulissi. Luis comes up and through on the left. Amador second, Jungels third, Nizzolo winning the sprint for fourth, several seconds behind. Amador takes 6 bonus seconds, Jungels takes 4. So Amador closes in on the pink jersey by 2 seconds. But it's a day when Jungels extends his lead over most of the GC contenders. Bob Jungels -- what a rider. Animated a particularly beautiful #Giro stage today & kept the pink jersey. Charly Gaul would be proud of him. What a race! Granted, there were 200 flat kilometres, but after that we were treated to some of the most gripping racing of this Giro. So, with the exception of Amador, Jungels extends his GC lead by 17 seconds. Always refreshing to see the pink jersey going on the offensive. A great ride from Ulissi, too, who played it perfectly. Drop the faster men on an uphill section, allow the other two leaders to push it on, then appear at the end to finish it off. Gianluca Brambilla talks to Eurosport after the stage. He was one of the riders caught up in the big crash and lost three minutes. He's down to ninth overall. "I'm a bit sad because I had a fall. I wasn't injured but it destroyed my wheel and I lost a few minutes. It was bad luck because my position was fine - on the wheel of Jungels. But it's great that he kept the jersey." "I came here for a stage win and now I've got two, so I'm very happy - for the team as well because they worked very hard. They chased down the break today and spent a lot of energy doing so. We controlled it well after that - even Modolo worked for me. It was hard on the climb but I'm going well on the climbs at the moment. I can thank Mohoric and Conti for setting me up. I didn't want to wait for the sprint. I managed to save a bit of energy on the downhill bit and was able to use it in the sprint." “I was expecting an attack from Amador, so I just went with him and in the end I felt really good. I wasn’t expecting that last small cobbled climb, when Ulissi jumped across, and in the end I thought I would go for the stage win, which would be hard in a sprint or I just keep pulling to gain time on the others. I lost two seconds on Amador but I gained a few on the others, which isn’t too bad. “I was surprised that Amador was working with me. When you attack, you also have to continue. Movistar had two cards to play with Valverde and him. These are the stages where I can still do something. I think in the harder stages with the big climbs, it will be harder for me, so I have to try to do my best here. A third place here isn’t too bad." 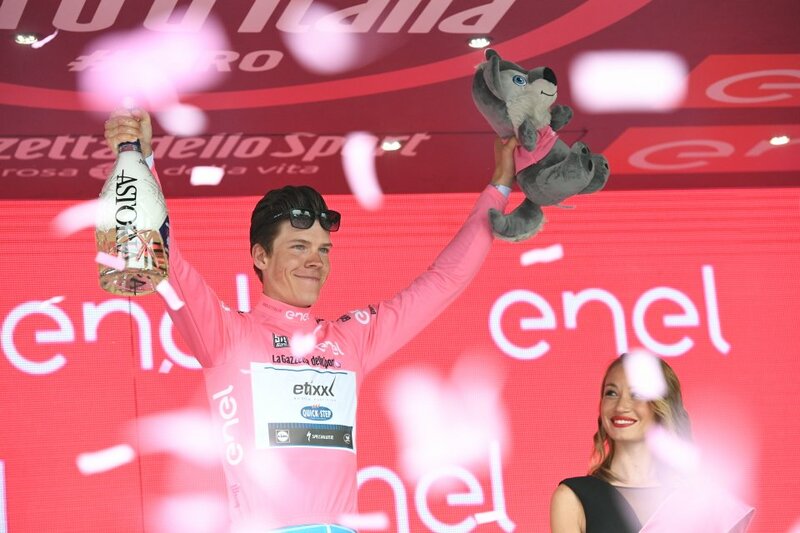 Bob Jungels holds onto his pink jersey - and in some style. An update on Pozzovivo there from Ag2r after the Italian lost well over a minute having been caught up in the big crash. "It's never ideal," he says, "but I'm going to get over it. The legs are good." Finishing with Pozzovivo and also losing 1:49 was Astana's Jakob Fuglsang. The Dane drops out of the top 10 and there'll be no more nagging questions over Nibali's suitability to lead Astana. That said, Astana are down a useful foil in the mould of Amador. Eurosport catch up with a Lampre directeur sportif, who hails his riders' teammwork and commitment today. Remember, they simply would not allow that early break of nine to stick. "It was a form of respect, this victory, for the team and their sacrifices. "We suffered a lot today. When the break went it was really difficult to bring it back with nine riders in there. In the end Diego was special. As were Modolo, Conti…I don’t want to forget anyone today – everyone pulled their weight." So, onto the next stage. Stage 12. This certainly will be one for the sprinters. It has been given a one-star rating in the Giro roadbook, and could hardly be flatter. After that, though, the GC battle will burst into life with two mountain stages followed by that important uphill time trial. "Friday will be a hard day but maybe with the downhill the gaps won’t be that big. Saturday is a big day, a lot of time over 2000 metres, which should suit our Colombian friends. Then it’s the time trial which I’m looking forward to. I know the climb. It’s quite regular, not too steep, so it may be a chance for me to do something." Great shot of Jungels driving that trio over the cobbles. We'll have all the latest news and reaction coming in from our reporters in Asolo, so keep your eyes on Cyclingnews.com over the coming hours. In the meantime, here's our stage report, and I'll leave you with this shot of the winner.